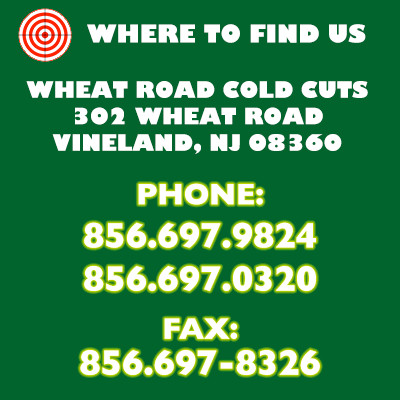 South Jersey's Best Sandwiches and Superior Catering Services. Call us to place your take-out order or to arrange catering for your upcoming event. Your message has been successfully sent to WRCC. PLEASE NOTE OUR NEW HOURS. We recommend that you place an order for pick-up at least 20 minutes before your expected arrival time. That will insure that your order is as fresh as possible. This does NOT apply to catering orders! We provide a full-service catering operation which can be accessed through our dedicated site at: WheatRoad.Catering. Please peruse our menu at your leisure and feel free to call us if you have any questions or require any assistance, pertaining to food items. If you are experiencing any technical issues with the catering ordering system or any other aspects of the website, please call the webmaster directly, at: 856.649.1001. Please DO NOT call the store for technical assistance.